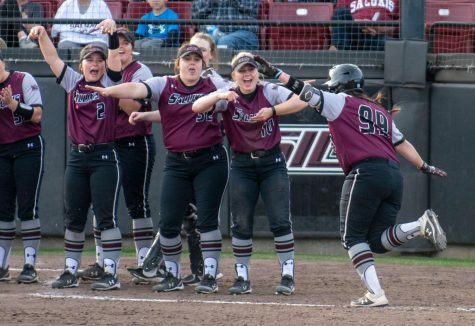 The final oay of the Coach B Classic called for a lot of home run firsts for everyone but the Salukis. 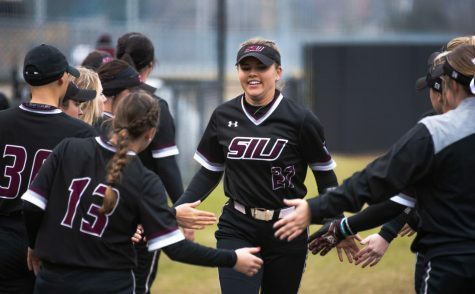 SIU softball fell to Northern Illinois, 9-3 and Murray State University, 8-7 in the final day of its tournament Sunday. In the last game of the day, the Salukis (9-10) faced an eight-run deficit off seven hits from Murray State University (15-4) in the top of the first inning. First baseman Shaye Harre put SIU back on the board when she hit a single to bring in the first run of the game for the Salukis. 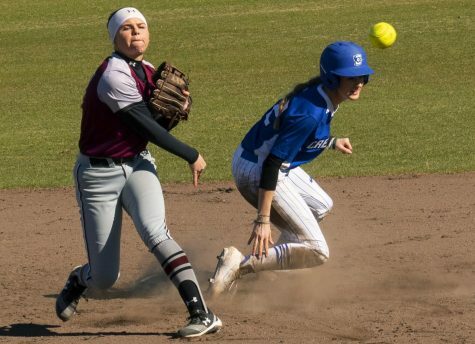 Meanwhile, Murray second baseman Erika Downey was distracted by a baserunner, allowing one more run to be scored by SIU. After a rocky start, sophomore Brianna Jones pushed for more changeups, making the Racers battle at the plate for a piece of her heat. 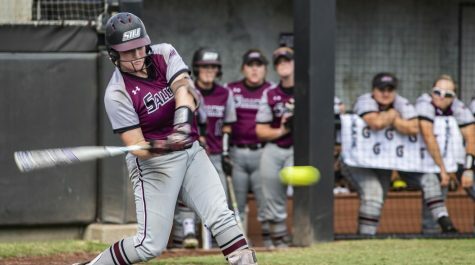 SIU junior Sydney Jones hit a line drive to center field — the ball going right above MSU centerfielder Kaylee Ranburger’s glove to earn Jones a double. A two RBI single in the bottom of the third came from Saluki DP Katelyn Massa to bring the Salukis closer to overtaking the Racers who led 8-4. Harre grabbed her first home run of the season from a two-run home run that was just shy of the foul pole. 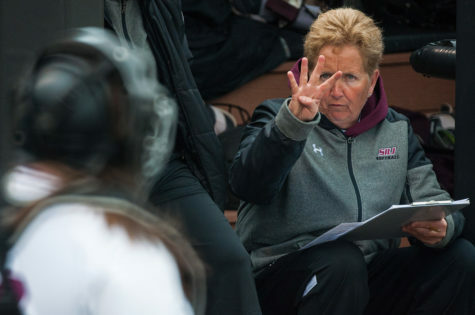 SIU Coach Kerri Blaylock was ejected during the inning after making clear her disapproval of a low strike call by the home plate umpire. 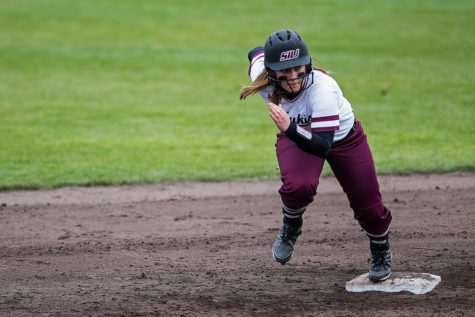 MSU third basemen Brenna Finck hit a double in an effort to exceed the score for Murray State, but was shut down by Brianna Jones shortly after hitting second base. Murray pitching change Amber Van Duyse gave up a double to sophomore Eyrika Brandenburg who brought freshman Maddy Vermejan home. The Racers led by only one run in the bottom of the sixth. Pitcher Brianna Jones brought the top of the seventh to a close quickly, giving the Salukis a chance to tie up the score. 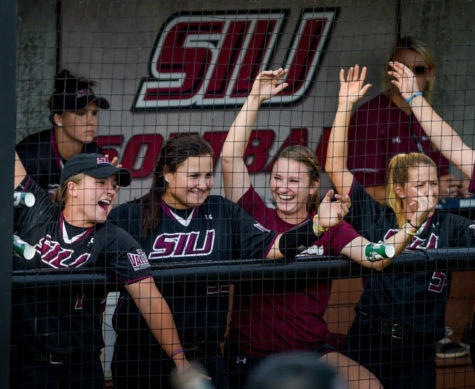 Center fielder Merri Ann Patterson hit a double in the bottom of the seventh inning with SIU’s designated player Massa on deck with just one out from the game’s completion, though she ended up walking. 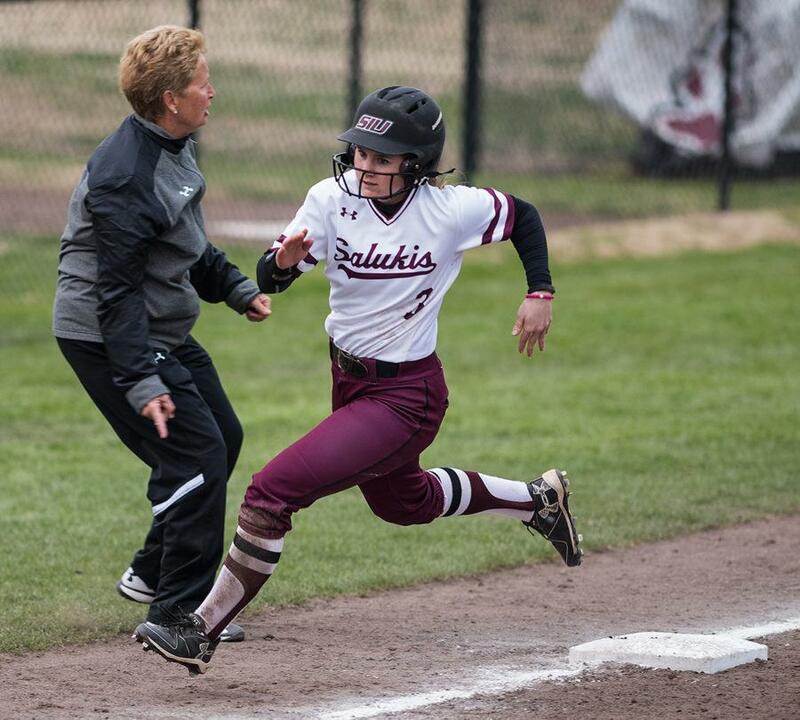 Second baseman Maddy Vermajan looked to be the hero to determine the Salukis’ fate, but she hit a line drive to shortstop with a grab from Racers senior infielder Maggie Glass ending the game. 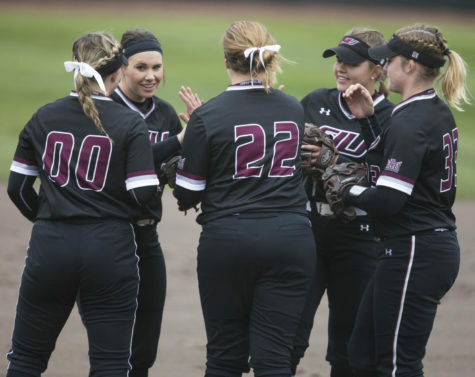 This was the Salukis second loss of the day after an earlier defeat to Northern Illinois. 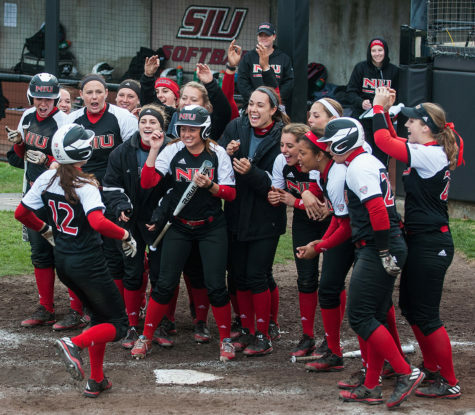 NIU (7-7) lost its first game against Western (6-11) early Sunday, 2-1. Brandenburg kicked off the game and hit a single into right field for the first hit for SIU (9-9). With the second at bat and fewer than 10 pitches served, the Salukis had runners in scoring position. Harre hit a two run double with no outs in the top of the first, putting SIU in the lead 2-0. 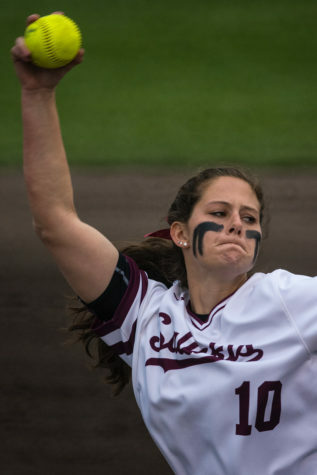 Huskies pitcher Alex Frenz brought the top of the first to a close after two strikeouts and a pop fly hit from SIU centerfielder Merri Anne Patterson to shortstop. Just five pitches into the inning, Bekah Harnish hit a homerun to left field, bringing NIU back into the game with a score of 2-1 Salukis. 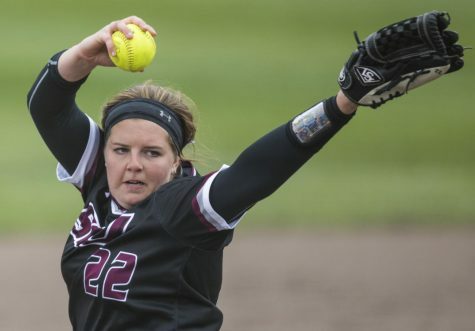 SIU pitcher Nicole Doyle was put to work by the NIU batting order, making it difficult for her to send one down the middle, but a pop up hit from Rebecca Rupard ended the inning. Harre had the wind on her side in her shot to center field, giving her two consecutive doubles. NIU’s Abby Howlett drove the pitch to right field, bringing home Kayti Grable, tying the score 2-2. A two run home run by 3B Sam Schmidt brought the Huskies into the lead 4-2. 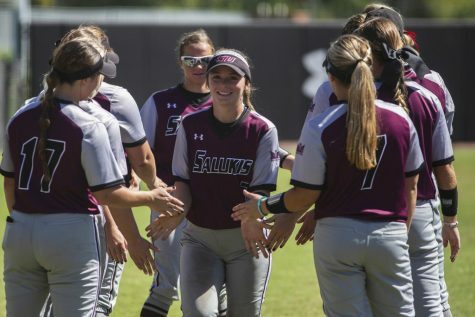 SIU brought in junior Savanna Dover, who hasn’t had any rest days between games, to relieve Doyle. She started off her performance at the mound by hitting NIU sophomore Jessica Rio. NIU centerfielder Jenny Van Geertry hit her first home run of the season and brought in two more runs for the Huskies, followed shortly thereafter by senior Kali Kossakowski with her first home run of the season. 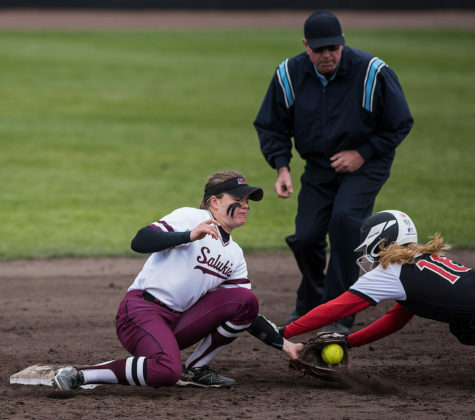 SIU outfielder Savannah Fisher’s diving catch brought the inning to a close. Freshman Susie Baranski hit a double which scored a run and got the Salukis back on the board, 7-3 Huskies. Geertry hit another two run double, tallying up the score for the matchup 9-3 Huskies in the bottom of the fifth, bringing her 4 RBI’s for the game. 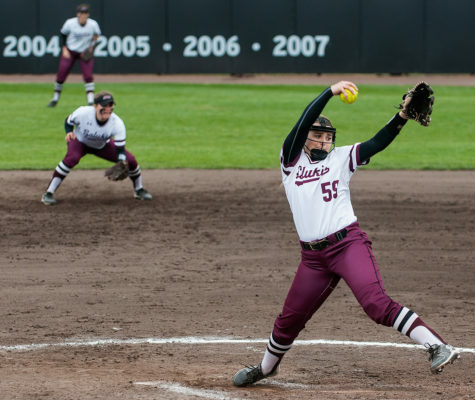 The Salukis tried to make a clean finish to the game, but took the L against Northern Illinois before facing Murray State in the last game of the tournament. 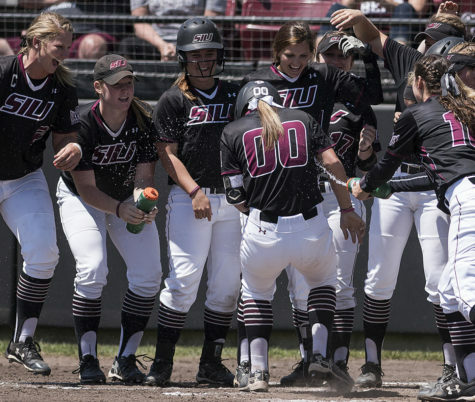 SIU heads to Las Vegas for the Rebel Classic tournament next weekend, starting off a tournament against UNLV on Friday. Sports reporter Gabriella Scibetta can be reached at [email protected] or on Twitter.